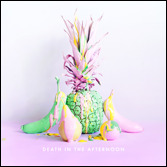 The Swedish electro-pop act Death In The Afternoon have been very generous with sharing their music this year. The band have released a number of impressive singles which have been supported by the likes of GQ Magazine, The Music Ninja, JaJaJa Music, The Line Of Best Fit, Nordic By Nature, as well as synced to a number of US TV Series. The upcoming self-titled LP begins with Let’s Talk, a track ready to immediately take you on a late-night drive around the Hollywood Hills (ok, it’s ready to take me to Hollywood, but you’re more than welcome to join) with its steady beat and effortless sonic brilliance. Followed by ’82, DITA keep playing with the evergreen romanticism softly implied by bands like M83 or Young Galaxy, whilst guiding the listener throughout the softly intertwined cinematic distant lead vocals of Linda and Christian. The nostalgic feel of Let Go, a fast-tempo summer soundtrack, presents the widely respected Scandi winning formula of writing songs filled with skill, quality and creativity. Oh, and let’s not forget adding the word memorable into the mix! The tempered instrumental atmosphere of We Don’t Have To Go Out Tonight is given a steady rise and a contrasting sense of melancholia, leaving us hopelessly enchanted throughout and wanting more… And more we get with a variety of moods, from the speedy The Horror which sounds like the perfect love-child between Robyn, La Roux and M83, to the Blondie Heart Of Glass inspired Tell Me What You Wished For. DITA are all about looking skyward and actually providing the sonic jetpacks essential to getting there. How do I know? Because TODAY! they’ve released a 9-track LP, which consists of singles ONLY! The more you listen, the more you’ll want to hear, and each song sounds better than the previous one! Their debut LP proves that DITA are all about skillful songwriting, vision, talent and artistic individuality meaning the only thing left for you to do is… press… play… now!